The College and Career Readiness Department is excited to host College Signing Day for our Lancaster High School Class of 2018 seniors on May 4 at Lancaster High School! The month of April has been a time of remarkable celebration of the hard work of students in Lancaster ISD even amid the peak season of testing. The district campuses and staff honored students for their character and academic excellence, celebrated student athletes, held the annual Special Olympics and various Fine Arts showcases. Although, we are nearing the close of this memorable school year, we are still teaching, students are learning and of course, testing. We are about 30 days from the last day of school, and we anticipate the celebrations of our staff and students success and the culmination of another year of excellence in education! The event will take place on Saturday, April 28 from 9 AM to 12 PM at Lancaster High school. There will be student presentation stations, vendor booths and activity stations, the 4C Gifted and Talented Competition, a buy one, get one free book fair and various Fine Arts performances throughout the day after the morning kicks off with the celebratory Rites of Passage Ceremony. This free event is open to everyone – parents, students, friends and community members. 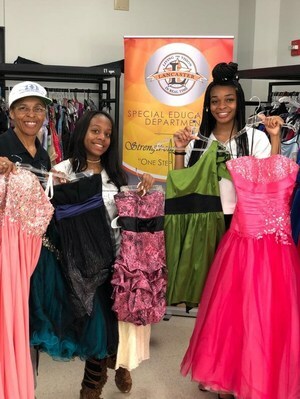 In April, more than 200 LHS students have already selected their special suit, or found their perfect dress at the Lancaster ISD Strengthening Families Prom Attire Pop-up Shop and Giveaway. Lancaster ISD students in the second through twelfth grades will compete against students from Grand Prairie ISD, Ferris, ISD Terrell ISD, Waxahachie ISD, and Uplift Charter School, with hopes of bringing home gold medals and Special Olympics bragging rights. The students will showcase their skills in several different running and field events throughout the day, which will include the shot-put throw and long jump.